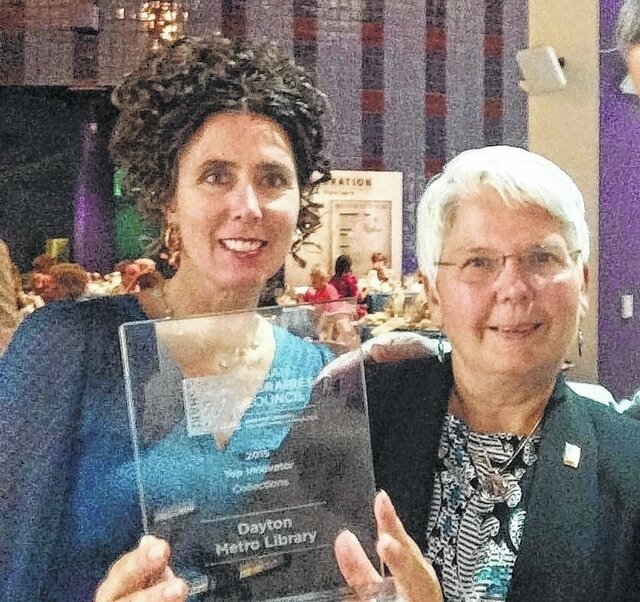 Jennifer Spillman (left) and Jean Gaffney (right) with the Urban Libraries Council Top Innovator award, presented June 25. The Collections Innovation Award is one of 10 categories that recognize the value and impact of public library service in the 21st century. In particular, this award recognizes innovations in the curation or creation of print or digital content and new collection development practices, among other criteria. The Local Author Collection includes both self-published and mainstream published authors of all ages, for all ages. It includes fiction and nonfiction, books written as class assignments, poetry and audio-visual material. The items are catalogued and can be reserved and sent to branch libraries as requested. Since 2012, the Library has added approximately 300 items to the Local Author Collection. In 2014, these items circulated 355 times, a 47.9 percent increase in usage. In April, thirty Library-sponsored local authors joined other writers and vendors in conjunction with the Dayton Book Expo at Sinclair Community College. More than 450 people attended the event. The Urban Libraries Council, founded in 1971, is a membership association of leading public library systems in the United States and Canada. For more information about the Local Author Collection or event, visit DaytonMetroLibrary.org or call (937) 463-BOOK.